On a far happier note, while Matthew Arnold and his family were living in Belgravia, they had twice taken advantage of the new railway station at Dorking in Surrey to spend holidays in the nearby village of West Humble, where Arnold had been "perfectly astonished" by the beauty of the Box Hill area (LL III: 43). It was a popular beauty spot, and they had found that Thackeray's daughters were staying close by as well. 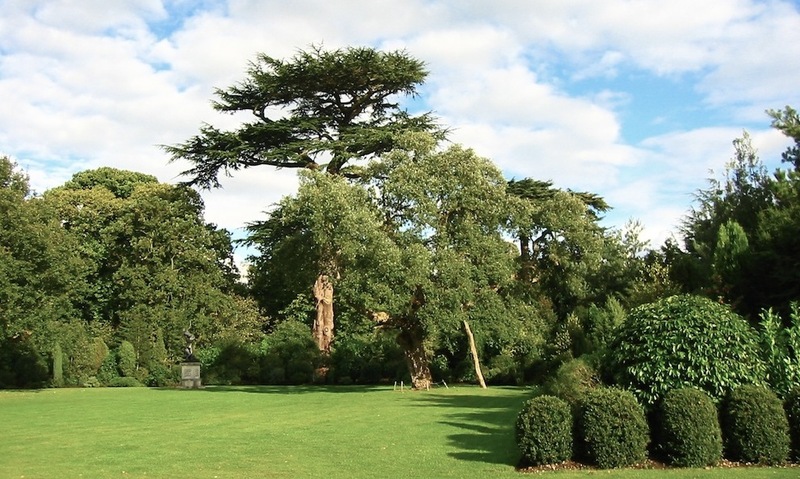 The "yews, boxes, limes and beeches of Norbury" had enchanted Arnold (LL III: 50). When he made up his mind to leave Harrow with its painful memories, he naturally thought of Surrey again. Laleham, his birthplace, where his aunt Susan's old house on Ferry Road was available, was one possibility. But among the other Harrow parents were the present owners of Painshill Park, not far away from Laleham in the little Surrey town of Cobham. This was a fine old house set in magnificent eighteenth-century pleasure grounds, and in 1873 the Arnolds decided to rent the old bailiff's house on the edge of their friends' estate. 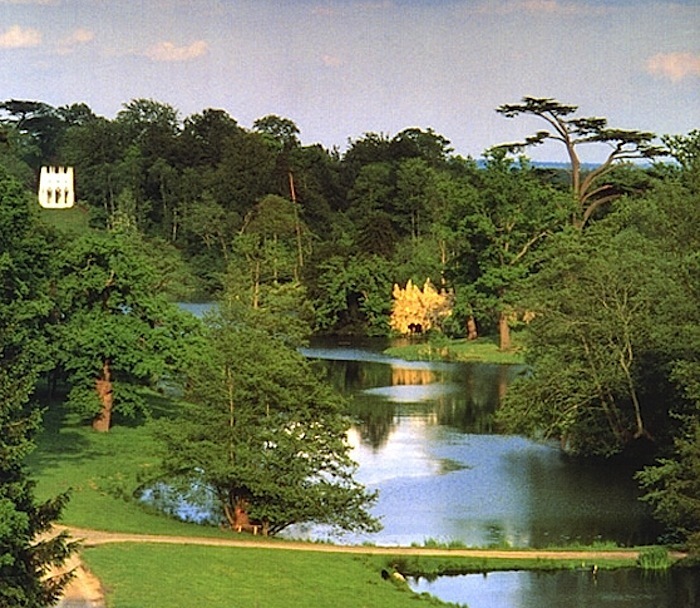 Left: Painshill Park, Cobham, Surrey, showing the Gothic temple above left, and the hermit's grotto in the stony outcrop, below right. Courtesy of the Trustees of Painshill Park. Right: Painshill Cottage, the Arnolds' home in Cobham, his "rural Grub Street." Courtesy of David Taylor. 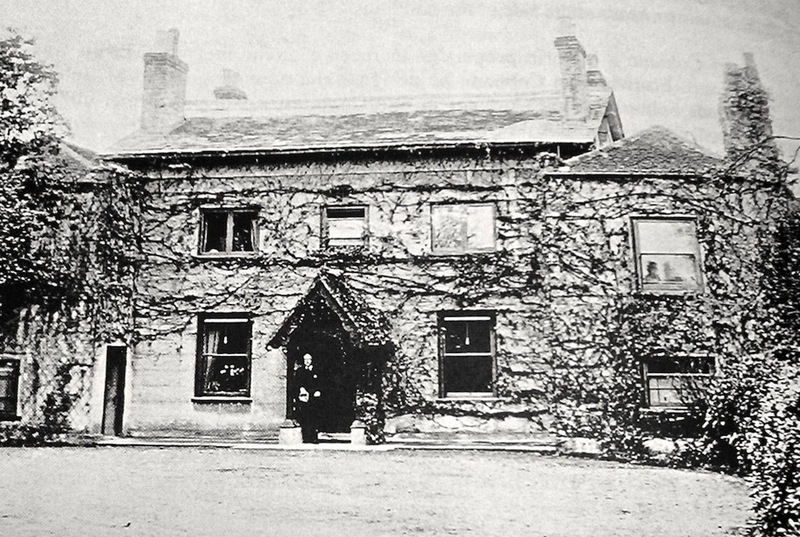 Vine-covered eight-bedroomed Pains Hill Cottage, which Arnold referred to as a "nutshell" (LL 4: 165), would be their home for the rest of their lives — in Arnold's case, for another fifteen years, in his wife's, for about twenty-eight years. Their latest blow had been almost insupportable, yet they still had their son Richard, and two daughters, Lucy and Nelly, and knew they had to get over it somehow. Typically, living in the countryside, and working hard, were the two remedies that Arnold prescribed for himself. On his earlier visits to West Humble, he had got to know the current generation of Evelyns at Wotton (the descendants of the seventeenth-century diarist, John Evelyn), and now he describes himself proudly as having truly become, "as Evelyn is pleased to say, 'a Surrey man'" (LL IV: 207). Properly settled at last, and over the worst of his grief at the loss of yet another son, he regained the energy and commitment to continue with his work, both as an educationist and as a writer. His ideas in the two spheres of action overlapped, and gave him a strong sense of mission. As an educationist, he was an early spokesman for state-aided schooling for all, and as a critic of society and literature, his priority was the education of the general public's sensibility, the deepening of its humanity. It was in these years that he published such major essays as his Preface to Wordsworth's Poems (1879); "The Study of Poetry" (1880); and "Literature and Science," which was first delivered as the Rede lecture at Cambridge in 1882. One of Arnold's favourite trees in Painshill Park: the only surviving cork oak (roped off and propped, to the right). Courtesy of the Trustees of Painshill Park. This hints at his own development in relation to nature, as well as being a good argument for education — and, of course, a valid criticism of Wordsworth's generalisation in the Immortality Ode. Arnold had become something of a botanist by now, as well as a great gardener, occupations which grounded him firmly in the specific, and his determination to "see the object as it really is" (another of his pet phrases) comes through in this essay as a whole. Most important of all, Arnold's sense of beauty gave him one of the cornerstones of his philosophy. He knew as well as the Dickens of Hard Times that without the ability to respond to our world with our hearts, we will lose our humanity. Even today (or especially today, when his dark prophesies about the debasement of society seem to be coming true), no one can ignore his views in "Literature and Science," where he argues movingly for literature as a means of guiding our conduct and developing "our instinct for beauty." Here he suggests that "the great majority of mankind ... would do well, I cannot but think, to chose to be educated in humane letters rather than in the natural sciences. Letters will call out their being at more points, will make them live more" (654). Arnold did more than anyone to establish the tradition of liberal humanism, both in Britain and America, and until the late 1960s at least, literary critics were all more or less "Arnoldian." In the last few decades, contemporary critical theory has shifted the emphasis from the author's moral vision to the structure of the "text" or its political or social engagement, or its elements of "life-writing." But T. S. Eliot's words about Arnold from 1930, which shine out unexpectedly from his otherwise quite negative and and even disdainful essay on Arnold, still ring true: even if we are no longer his "disciples," most of us do read literature for its life-enhancing quality, and can still turn to Arnold "for refreshment and for the companionship of a kindred point of view to our own" ("Arnold and Pater," 432). Arnold, Matthew. "From 'Literature and Science.'" In Matthew Arnold: Poetry and Prose. Ed. John Bryson. London, Rupert Hart-Davis, 1954. 642-56. _____. The Letters of Matthew Arnold (cited as LL). Ed. Cecil Y. Lang. 6 vols. Charlottesville and London: University of Virginia Press, 1996-2001. _____. "Wordsworth." In Matthew Arnold: Poetry and Prose. Ed. John Bryson. London, Rupert Hart-Davis, 1954. 698-714. Taylor, David C. Cobham Houses and Their Occupants: A Thousand Years of History: Cobham's Book for the Millennium. Cobham: Appleton, 1999.